Our first lesson since December, and as usual, it came with a few stupid epiphanies. I would even say it was riddled with stupid epiphanies. They started AS SOON as May and I started walking. That’s right. I couldn’t walk right. Over the winter, we have worked a lot of May’s connection in the bridle being more steady. (aka – less head wagging, looking up to see what’s going on outside the arena, and truly engaging the hind end) All of this was actually very much improved and my trainer was impressed (yay!). What she was not impressed with was my new found love of pushing May past her point of balance. May is not a big, fancy, expressive mover. She moves correctly, especially when fully engaged, but she’s not a horse that is ever going to have a massive walk stride. My solution? Just keep pushing… all the way past her balance. As a result, she get a forward but oddly stumbly and uneven walk. Literally my trainers words were, the bottom of the pyramid is rhythm, and you don’t have it. Well damn. So I sat in the saddle, quieted my hands and legs, and we immediately found a better walk. Alright, I got that. Then we were asked to halt, and May’s head came up, she braced against me, and she stopped. So we proceeded to work on the walk/halt transitions. I would ask May to halt, and if she came off the contact, I would send her forward again… for about 10 minutes. Below is some of it. I was reminded that it might take 700 tries, but that on the 700th try, it would be great. We finally got a halfway decent walk, so we moved into the trot. In an effort to keep May on the contact, I was keeping her too keep in the contact, and she was falling behind the vertical. Luckily, May is, surprisingly, not a horse that loves being behind the vertical, so this was as easy as engaging my seat and lifting my hands. We did a few W/T/W transitions, but those were significantly better than the W/H/W transitions, so we didn’t dwell on them. We made some tweaks to how much bend I was asking for, but most of the trot work was just fine tuning, which was nice. We kept the tempo and energy slow to make our adjustments, so it’s definitely not the nicest looking trot May can muster, but it’s a great one for building strength and fine tuning our connection, rhythm, and balance. Then we went to canter. 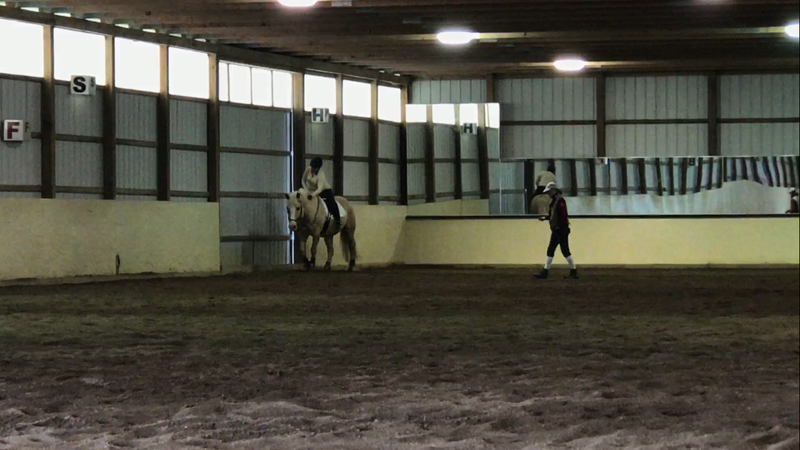 Before we cantered, I was told to sit the trot… We ended up cantering one circle, and sitting the trot for 15 minutes. I will fully admit that I do not sit the trot often. I am not great at it, and I am not light enough to be bouncing all over my horses back. However, my trainer had a good point. My horse does have a strong back, I need to have a sit-trot in my arsenal for training, and it won’t get better by ignoring it. I do what I believe most people do at the sit trot: I sit fine until I get unbalanced, then I try to correct with strength. The result is, I get stiffer and the sit trot get worse. The solution? For me, it’s to just keep moving my hips. Sometimes I am with the motion, and it works. Other times, I am not with the motion, but it is still better than being stiff. My trainer talked about how our bodies have the ability to rotate our hips in basically any direction except straight up and straight down, which is when we bounce. I am sure you see her in the video moving her hips around, attempting to inspire me. She is definitely the kind of trainer that rides “with” you! Overall, it was a really good lesson. My new trainer (NT) teaches in a vastly different manner than my old one (OT). It’s almost the difference between having a task-based job, and an project-based job. In the former, you are assigned specific, short-term tasks with deadlines and a good deal of oversight. In a latter, however, you are given the overarching goal and are responsible for setting up your own tasks and deadlines to complete the project. Does that make any sense, whatsoever? Basically, if May started losing her rhythm with my OT, I would get very specific instruction on the timing of lifting this rein and applying this leg and changing my seat here. With my NT, she points out that we are losing our rhythm. It’s not that she doesn’t help me correct things more specifically, but she forces me to think about how I can solve a problem, rather than me simply following a set of directions to get a specific result. It is mentally exhausting, but I can already see the impact it is having on our rides outside of lesson. Which do you prefer? Trainers that walk you through every step of your ride, or trainers that force you to come up with your solutions. I’m Alive and Things Have Been Happening! This entire winter has been an exercise in patience. I have ridden May on more than one occasion where I have basically had to throw the baby out with the bathwater. Most days, she is lovely to ride and really tried hard to do what I ask, when I ask. However, with inconsistent work and frankly ridiculous weather, some days have consisted of just trying to not plow through my hands and run around the arena. Luckily, with the fiance back in town for the foreseeable future, I am hoping to get back into a real schedule. The fiance back in town also brings about another bonus: NEW MEDIA! So after May and I had that overly enthusiastic last jumping session, I decided to go back to basics a bit. I also switched bits. Anyone that has followed this blog for a while knows that sometimes May likes to throw her massive head around far more than necessary. 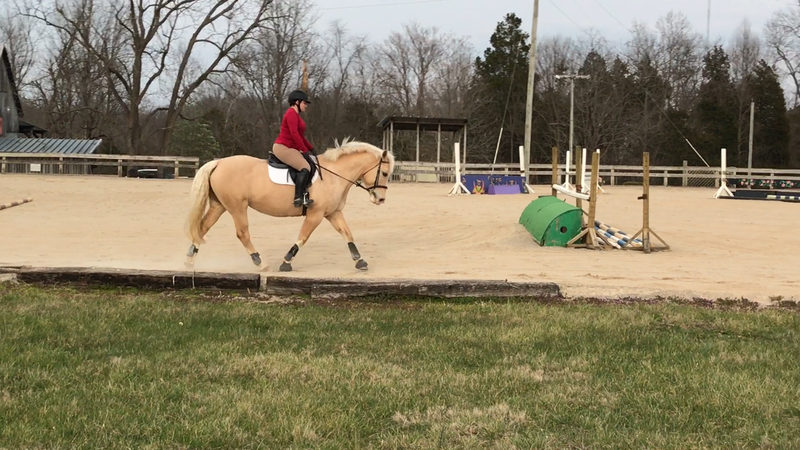 For a while, I have debated changing up her jumping bit; however, I knew that at least 75% of the problem was me and my love of the inside rein. During our last jumping sessions though, she was beyond unreasonable about the Dr. Bristol. At one point, I wasn’t even touching her face, and she was throwing her head up and flinging it around. I thought maybe the tongue pressure is driving her a bit batty, so I broke out what is quite possibly one of my favorite, but oddest bits. Most people look at this bit and think it works just like a regular pelham, but it really doesn’t. There is a good deal more isolation allowed in this bit than with a typical pelham because each side of the mylar rotates independently. As a result, the curb chain doesn’t really get activate unless you use both reins at the same time or get really strong on one rein. What does this mean for May and me? This is kind of Equitating, right? It means its a lot more difficult for her to lean on me, but when she is soft and light, it gets VERY passive. We tested it out on the flat a couple of times to help her get an understanding of how the pressure works. Then, I just set up one jump at the end of the ring, and took her over it a few times. We worked on balance and rhythm, while I concentrated on my form. May stayed relaxed, and while she objected to the pressure when I was holding her, she didn’t continue to fling her head around when the pressure came off. I am going to see how she adjusts to this bit with a bit more practice, but I think this is a step in the right direction! Next blog post – Dressage Lesson!